Any got 15/15 or bigger with this? The Arena Value of this card has gone up quite a bit thanks to Giggling Inventor. So if you see this card, draft it! Giggling Inventor - "Hello, hello!" Recently - I have see a huge increase in divine shield minions. It's almost like something strange changed in the last two weeks (not sure what) but suddenly, every deck I play has a few divine shield minions - in particular C'Thun's Chosen, Argent horserider, Argent Squire, and Sunwalker. I had previously seen just a few of the horserider and squire cards - but now I see a lot of those other two cards. There aren't too many cards that can really take out the divine shield directly. Under normal circumstances - you have to use a two card combo. It can be very costly to remove a divine shield card. Not only is this card great for that but toss in a few squires yourself and get a cheap 6/6 card for 4 - early in the game. 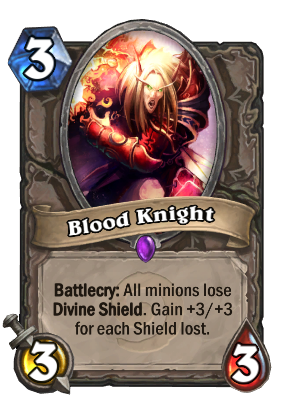 Cool combo: If your opponent has Steward of Darkshire on board with <5 minions and you have 8 mana and Leeroy Jenkins and Blood Knight in hand you can give the whelps divine shield and use them to buff blood knight immediately. Just pulled that off lol. With this hell lots of Paladins. I am surprise that no one use this card. But then again, when you didn't play against pally or mech decks this card is just 3 mana 3/3. Man, this guy is really insane! It seems like auto-win whenever I face Pally and draw this card. His tempo changing is unbelievable, sweep 1-2 shield from bots or argent protectors or squires and you get 6/6 or 9/9 for 3 mana! I can't remember how many times Pally opponents use Truesilver to take 6 damages, only to see my taunt minions next turn. 80% win rate against Pally now, so much fun! Even against other classes he is still a 3/3, not so bad especially when YOU play Pally. Very interesting. Given how many paladins are in constructed right now, many decks have started teching this in. And people say turn 1 Coin Unstable Portal Edwin Vancliff was the dream. Funny enough, it's the same thing except his case the Squire lost the divine shield. That's really surprising, actually.